It’s a wonder why interest rates are not a topic that sparks a great deal of concern and discussion among affluent investors. But investors, in general, do not spend a great deal of time thinking about federal interest rates, even now when the possibility of interest rate increases are on the rise. Banks and financial providers obsess over the potential changes in the interest rate, but investors do not focus as much on the key federal regulation. As defined by Investopedia, the federal funds rate is the rate at which a depository institution lends funds to another depository institution overnight, and is only applicable to the most creditworthy institutions when they borrow and lend overnight funds to each other. The rate is used as a benchmark for all other lending institutions as well as all investment vehicles which offer interest as an incentive to invest. While the rate is usually maintained between 2 and 5 percent, it rose to 20 percent during the inflationary years of 1979-1980. When the first 21st century recession hit in 2001, the rate dropped to 1.0 percent, but rose again to 5.25 by 2005. In response to the 2008 Great Recession, when banks were failing and the federal government offered the largest institutions a bailout, the rate dropped to 0.25 percent, which is considered effectively a 0 percent rate. With the economy slowly improving since the Great Recession, the federal fund rate was bumped up to 0.5 in December of 2015, bumped again to 0.75 in December of 2016 and then to 1.0 in march of 2017. Federal Reserve chairman Janet Yellen has suggested that a continued stable economy could prompt more increases in 2017. While the historically low interest rate made loan rates attractive for the purposes of buying homes or automobiles, it also made the rate for investment profits in fixed income products low. When the Fed holds its quarterly meetings during which it announces any changes in the federal fund rate, the U.S. economy holds its collective breath, because a change in the rate creates a change up and down the investment food change. And yet, investors do not express much thought or concern over the federal fund rate. 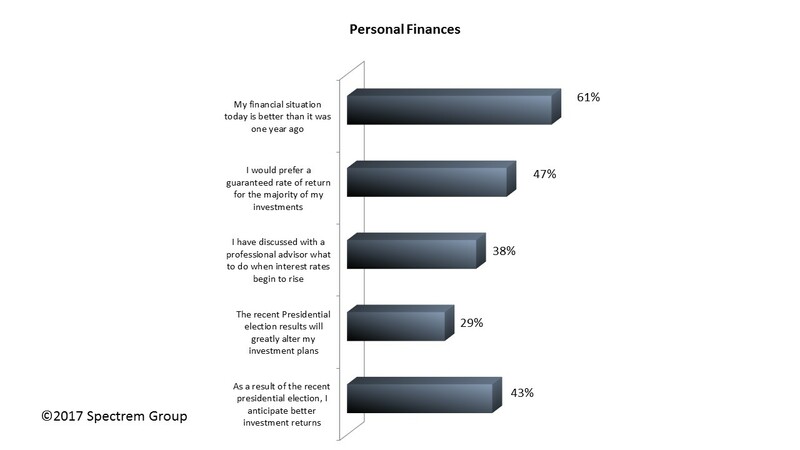 In Spectrem’s quarterly wealth segmentation series study Financial Behaviors and the Investor’s Mindset, only 38 percent of Millionaires with a net worth between $1 million and $5 million say they have discussed with their financial advisor what do when interest rates change. While the response begs the question as to whether the advisor or the investor brought up the topic, the fact that less than half of Millionaires have had the conversation at all is noteworthy. (Among Ultra High Net Worth investors with a net worth between $5 million and $25 million, the percentage climbs to 50 percent. Still, that’s half the wealth segment that has not had the conversation about interest rates and their effect on investments). There are investors for whom a change in the interest rate will have minimal effect upon their overall portfolio of investments, but for those investors who stand to be seriously affected, advisors need to make contact and suggest the changes that will most benefit those investors. Likewise, if an investor is known to have plans that require taking out a major loan (home buying or other new liability), advisors should make suggestions that can reduce the cost of the loan. The Spectrem study looks at the question of interest rates from both angles. Among Millionaires, 57 percent express concern over the low savings interest rate they receive, while only 34 percent express concern over an increase in interest rates. Perhaps the difference is between those who are expecting to benefit from interest rates as opposed to those who must pay interest rates on loans. In both cases, the percentage of those concerned was significantly lower than in 2016, perhaps indicating that the anticipated rise in federal interest rates to a more normal level decreases concern over the issue nationally. There is yet another angle to the interest rate story, and that involves retirement funds. Many investors aim to invest in products that will produce income upon retirement, and that amount of income is determined by the current interest rate offered by investment firms. When the interest rate is low, as it has been for almost a decade, it negatively affects the income retirees will receive. While Millionaires in general expressed a low level of concern about their retirement funds being depleted too early in their retirement, 41 percent of Millionaires said the low interest rate on savings and other forms of retirement income was the reason they had concern over failing to have enough money in retirement. Financial advisor and providers watch the federal interest rate debate like hawks. They should keep investor apprised about the concerns they have and how it will affect investments going forward. Since interest rates are increased on a quarterly schedule, advisors can plan their meetings with investors and present their advice accordingly so that any interest rate increase comes as an expected outcome rather than as a surprise.